This guide is for how to properly dump Floppy Disk images on a Windows PC. Ensure that you have the proper hardware. This seems like a simple step, but keep in mind that most 5.25" floppy drives cannot be connected to modern computers without a special interface. So for the remainder of this guide, 3.5" floppy disks will be referred to most frequently. There are USB floppy drives available and nearly any of them will work for dumping (example). For other floppy drives and formats, consider getting a KryoFlux since it is the most versatile (though very expensive). Choose your dumping software. 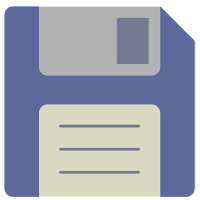 The current 3 best options for dumping floppy disks are: DiscImageCreator (command line interface), WinImage (graphical user interface), and for KryoFlux hardware only, KryoFlux Host Software (graphical user interface). Both DiscImageCreator and WinImage write out to the same type of file, which is essentially a raw floppy disk image. KryoFlux writes out to a special format that better preserves the entire disk including physical disk protection (that is not captured by the format that DiscImageCreator and WinImage write out to), but is harder to read and write. Using the dumping program of your choice, follow the floppy disk dumping instructions and create the image. For DiskImageCreator, run "DiskImageCreator.exe fd <DriveLetter> <ImageName>". This will create the image with the extension .bin along with some additional text files with information from the dumping process. For WinImage, select your USB floppy drive under the "Disk" menu. Then click the "Read Disk" button. Make sure that you save it in "IMA/IMG" format and not "IMZ" format. IMZ is a compressed image that is not as original as the IMG format. For KyroFlux, please refer to their documentation and guides here. Once you have all of the disks for a particular game or program, you are all set! We recommend submitting your disc images to The Good Old Days preservation project on their forum here.